Will a wave of protests spark reforms? 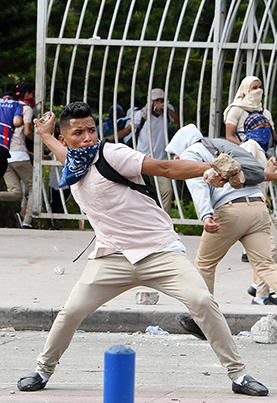 Anti-government protests have erupted in four Central American countries in recent months, aimed at leaders of a region long plagued by political corruption, gang violence, drug smuggling, poverty and weak law enforcement. Homicide rates in the Northern Triangle — Guatemala, Honduras and El Salvador — are among the world's highest, and the increasingly authoritarian regime of President Daniel Ortega threatens stability in Nicaragua. The demonstrations are part of a fledgling anti-corruption movement in which protesters, prosecutors and investigative commissions have recommended that dozens of officials be jailed. But strongmen such as Ortega and Guatemalan President Jimmy Morales are pushing back, triggering even more dissent. Tens of thousands of Central Americans — many of them unaccompanied minors — have in recent years tried to flee to the United States, prompting the Obama and Trump administrations to crack down on undocumented immigration along the U.S. southern border. Meanwhile, the United States has become increasingly concerned about China's growing political influence in Central America.